We chose a good quality, 16″ square ceramic tile that is quite natural looking, with low-key and tasteful swirls of our favorite colors through it – pink and green – on a neutral gray/green background. We wanted the tile to be installed on the diagonal but it was more expensive than we were prepared to pay, so we decide to have it in squares downstairs and just install on the diagonal in the upstairs bathroom only, which is Elizabeth’s job. Our tiling guys told us they could get the downstairs tile installed in a day and a half, over the weekend, and by midday on Sunday, they were pretty near done. 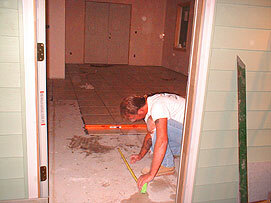 Here one guy is carefully measuring the space he has left and marking the area with lines to show him where to place the tile. As soon as the downstairs tile was finished, we heard that our oak “shaker” kitchen cabinets had arrived at the installer’s. In this photo, it’s Tuesday, the tile is all ready to go and Elizabeth is removing excess thinset mortar from between the tiles prior to grouting the kitchen floor and Barbie is showing that she’s done with painting the kitchen walls. Twenty minutes later, Elizabeth was deep into her first attempt at grouting tile – and it was much messier and more tiring than she thought. 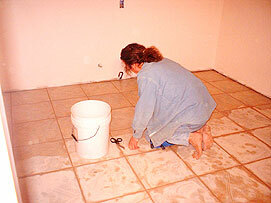 Here she is cleaning off the excess grout from the surface of the tile before it dries. It works best with three containers – one for fresh water, one to squeeze the dirty water into and one to wash the sponge out in. 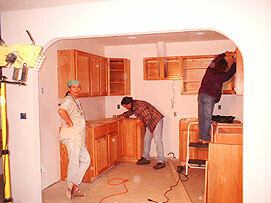 The next morning, Harry and Donna had the cabinets fitted around the walls before we got it together to find the camera. Here they are installing the doors. We ran power from the mobile home for tools and lighting. Check out the halogen lights and power cords on the floor. 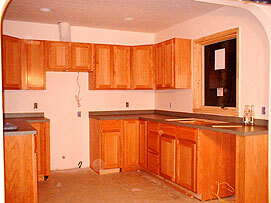 Note the stove hood pipe emerging from the wall cabinet at an angle. One of those measuring mistakes that just happen and can’t be fixed without major turmoil, time and money. The pipe will need to be hidden at a later point. 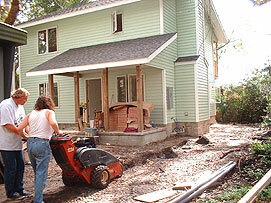 Meanwhile, Elizabeth and friend Rick are wrestling with the ditch digger outside. We decided to go with putting the utilities to the house underground even though it was expensive and a lot of heavy work. You have to make decisions like this all the time to ensure your home is built and served most appropriately for your needs. We started three trenches before we discovered the appropriate “S” shape that missed underground root systems and stump fragments. Wrestling this machine was hell! In less than 8 hours of work, Donna and Harry had the cabinets beautifully finished and the rich, mossy-green counter tops in place – and they cut the hole for the sink, too. If you look closely, you can see the cables for the range hood and the dishwasher. If you look closer still, you can see the bottles of beer that were consumed on completion of the work. Although neither of us drink, we kept beer on hand for our workers at all times – but we only handed them out when work was done. Ditch-digging trials over, Elizabeth turns her attention to tiling the upstairs bathroom. 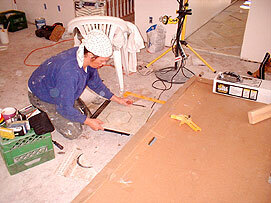 This photo shows her in the main bedroom cutting an octagonal hole with a tile wetsaw so the tile can be fitted over the hole for the toilet. 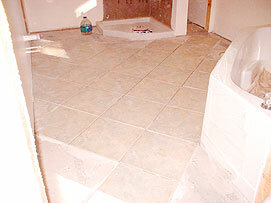 In front of her is the shower kit box and you can see some tile already laid just inside the door to the bathroom. It’s usually a challenge to tile at a 45° angle like this but, in this case, very much worth it because of the 45° corner angle on the tub and shower. 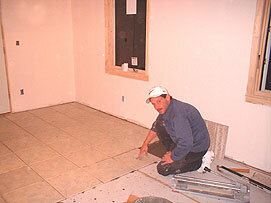 To begin with, Elizabeth focused on the center, where complete tiles were laid. Later, she’ll fill in with tiles cut to fit the edges and the linen closet, but this was enough for the plumbers to return to fit the toilet. Next up – the vanity unit. 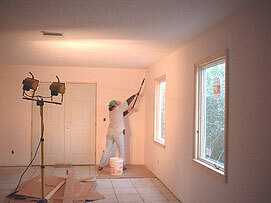 While that was going on, Barbie was downstairs putting a second finish coat on the walls. Sheesh – will the painting never end! 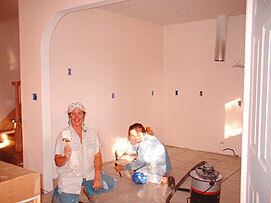 It didn’t help that Elizabeth changed the bathroom colors on her while she was in the middle of painting them – twice! Note the lights again (we couldn’t have done it without them) and the cardboard boxes the kitchen cabinets came in used as “drop cloths”.